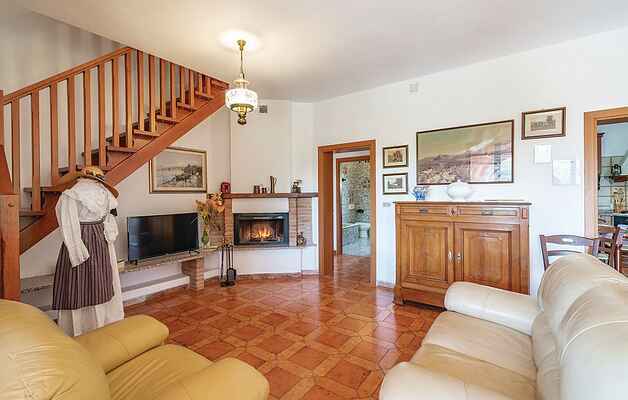 Holiday home in two-family house near Gavorrano (9 Km), in the countryside, only 6 Km from the beaches and 10 Km from the renowned Follonica. It features large outdoor spaces, swimming pool and whirlpool in shared use (for 5 people). This is the ideal accommodation for nature enthusiasts and for guests wishing to spend a relaxing holiday very close to the seaside. Gavorrano offers to its guests the Tuscan Mining Geopark, where you can visit two mining areas, with educational tours explaining the steps of the pyrite production, the "Teatro delle Rocce", a previous mine turned into a fascinating outdoor theatre hosting in summer various events, such as concerts, plays, ballets performances, meeting, exhibitions, but also many typical restaurants with traditional Tuscan specialties, for ex. wild board dishes or fresh fish every day. This town is also an excellent starting point to discover Tuscany's many sides and different attractions, ranging from the seaside resorts to the backcountry with its wine and food routes, the many wineries and farms where you can enjoy wine or oil tastings, with the Etruscan remains or the fascinating hamlets rich in history. To make the most of your days on the beach you will find the nearby Follonica, with its sandy beaches ideal for children, beach resorts equipped for outdoor sports, a lively night life with clubs open until late, as well as the Gulf of Baratti, the coves of Cala Moresca, close to Piombino, and Cala Violina, in the Gulf of Follonica. Other towns in the surroundings are worth visiting: Massa Marittima, Medieval town, Castiglione della Pescaia, with its majestic castle and Grosseto, with the well-preserved historical center. Don't miss the chance to visit the most renowned Etruscan towns, such as Vetulonia, with its archeological site, Populonia, with a lovely historical center from which you can enjoy a wonderful sunset, Roselle, Saturnia, with the thermal baths, Bolgheri and much more. Nature enthusiasts can reach the Maremma Natural Park in Alberese (40 minutes' drive) and dive into a pristine environment with a rich local fauna. This rich territory also offers pleasant walks and hikes, mountain bike rides, horse rides, thanks to the many riding centers in the area, and a water park near Follonica, for the entertainment of the whole family. ITM291, ITM292 and ITM293 in the same property. The accommodation is located on the first floor.